SULLIVAN WEST QUARTERBACK Jim Moloney runs for a first down thanks to a block from teammate Dan Figueroa (37) during the Bulldogs’ Homecoming Game on Saturday night versus the Spackenkill Spartans. Chasing Moloney from behind is Spackenkill defensive back Patrick Martin (48). 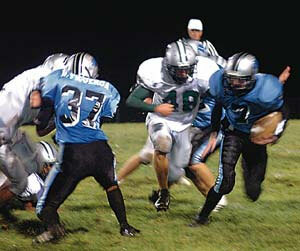 LAKE HUNTINGTON  October 16, 2007  The Sullivan West Bulldogs were determined not to let Spackenkill ruin their Homecoming celebration on Saturday night. As Homecoming King Eric DeLaurencio, Homecoming Queen Camille Peters and a large crowd looked on, SW grabbed a 21-0 lead in the first quarter and rolled to a 52-13 victory over the Spackenkill Spartans in a non-league football game at SW High School in Lake Huntington. The Bulldogs received the opening kickoff and proceeded to march 80 yards to paydirt. Senior fullback Will Schlott capped the nine-play drive with a 4-yard touchdown run. Artie Norden then kicked the ball through the uprights for the extra point to give the Bulldogs a 7-0 advantage with 6:50 left in the first quarter. SW (4-2) stopped Spackenkill (0-7) on its first possession. On fourth down, Spackenkill’s Mark Letus dropped back in punt formation. But SW’s Jason Leewe came around the end and blocked Letus’ punt to give the Bulldogs the ball at the Spartans’ 30-yard line. The Bulldogs needed just one play to capitalize on Leewe’s big special teams play. On first-and-10, senior quarterback Jim Moloney connected with junior wide receiver Brad Reimer on a 30-yard touchdown pass. Norden added the extra point to make it a 14-0 game with 6:34 remaining in the opening quarter. Exactly three minutes later, Moloney threw a 5-yard touchdown pass to Dan Figueroa. Another Norden PAT kick extended the SW lead to 21-0. The Bulldogs scored three times in the second quarter. At 11:50, Moloney hooked up with Leewe on a 51-yard touchdown pass. At 8:19, Moloney ran for a 59-yard TD. At 3:14, Moloney rushed for a 25-yard touchdown. Norden nailed the extra-point kick following all three TDs as the Bulldogs enjoyed a 42-0 lead at halftime. Less than a minute into the third quarter, Reimer ran for a 42-yard touchdown. Norden added the PAT kick as SW took a 49-0 advantage. Norden scored the final SW points of the contest when he booted a 34-yard field goal with 3:09 remaining in the third quarter. Despite falling behind early, the Spartans displayed heart by playing hard the entire night. They got on the scoreboard twice in the fourth quarter. At 10:37, Spackenkill quarterback Nicholas Contelmo threw an 8-yard touchdown pass to Patrick Martin. Letus then added the extra point to make it a 52-7 contest. With just 1:01 remaining in the game, Contelmo connected with Martin on a 75-yard TD pass. Moloney led the Bulldogs’ offense by rushing for 167 yards on eight carries. Moloney completed 3-of-4 passes for 86 yards and three TDs. SW Coach Ron Bauer was pleased with his team’s performance. “They played well,” he said. “We had good blocking and the defense played well.